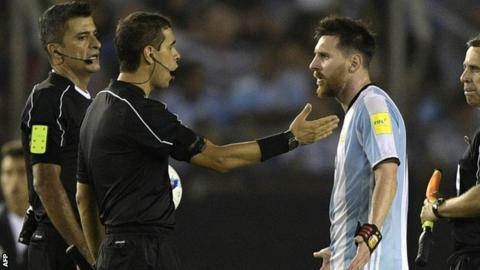 Barcelona have described Lionel Messi's four-match international ban with Argentina as "unfair and totally disproportionate". The 29-year-old Barca forward was suspended for directing "insulting words" at an assistant referee during Thursday's 1-0 win over Chile. He remains free to play for his Spanish La Liga club. In a statement, Barcelona expressed their "surprise and indignation" at the Fifa disciplinary ruling. "The club considers the four-match suspension finally imposed on the Argentine player to be unfair and totally disproportionate," the club said. "Finally, FC Barcelona wishes to reiterate its support for Leo Messi, an exemplary player in terms of conduct both on and off the pitch." Messi's suspension was announced just five and a half hours before Argentina's 2-0 World Cup qualifier defeat by Bolivia on Tuesday. The result saw them drop to fifth in the table, outside the top-four spots for automatic qualification for Russia 2018. Messi is set to be banned for three of his country's four remaining qualifiers.